> Digital or Cell Phone Camera? Which To Choose? DIGITAL OR CELL PHONE CAMERA? WHICH TO CHOOSE? Cell phone cameras are improving all the time. As of this writing, cell phone cameras can be obtained that have up to 3 megapixels of resolution, which is quite sufficient for taking pictures that can be published and distributed to friends and family. Owning any of the Imagener products can greatly improve what you can do with those photos as well. Therefore, if you are debating whether to buy a new camera or get a camera cell phone - we suggest getting and sticking with the best cell phone camera you can get your hands on because inevitably the exact time when you wish you had your "4MP digital camera" is the exact time when you decided not to lug it around. Many people choose to never lug around such cameras after the newness wears off, but you always have your cell phone with you. Having a high quality cell phone camera means you will likely catch many more candid moments and take many more pictures. My 3MP digital camera sits on a shelf most of the time - but I have many lower resolution images from my lower resolution cell phone camera simply because it is always with me. If you still want to get just a digital camera, we suggest purchasing one that is the most portable you can buy. The Samsung MM-A800 is the first 2+ Megapixel Camera In the US. It boasts high quality 2 megapixel photos with extra long video capture. Again, if you don't have a camera when life's photographic moments happen, its not like you can run home real quick and expect the moment to be there when you return ... unless you are photographing still life or subjects that are not action-oriented. The Canon PowerShot SD300 Digital Camera (right) is one of the smallest high-quality digital cameras on the market today. It is rated #1 by Consumer Reports® and we found the lowest price on the Internet - so low that it cannot be advertised. Click here. We have increasingly noticed that various customers have difficulty activating our products automatically. 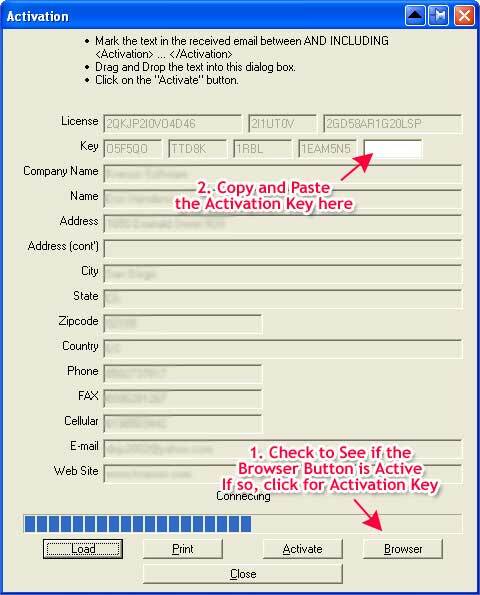 Over time we hav attempted to make this process as painless as possible, and have even graphically produced the instructions which many of you have seen (click here to see the automatic activation instructions). Our engineers have even enhanced the activation process such that when you try to automatically activate and get an error, there should be a Browser button that is clickable on the activation screen. Look to the bottom of the Activation Screen on the far right. Clicking this button will take you to a page that will give you a key value. This value is a code that you can copy and paste into the activation screen yourself in the 5th key position (see diagram to the right). There are some people that still cannot automatically activate. This is likely because over time, there have been so many programs that have been installed and abandoned that leave their "tracks" in the form of background processes that never get cleaned up. Some of these processes block communications ports and slow down your computer in many ways. This amount of programs and processes is not acceptable. There is no reason to have all of this running simultaneously. This is just one example out of many that we have seen. It turns out that there are so many software programs that want to install themselves on your computer for various reasons, that over time if you are not careful you could end up with this type of situation. Often if you look at the screen of a computer that is operated by children or teenagers you will notice this situation. Ask yourself if you really want to or can afford to give up valuable computer resources just so you can see the temperature outside or to support some theme that changes colors on your screen. Many of these programs are like getting a tattoo on your computer — once installed the only way to get rid of them is to reformat your hard drive and start over. If you have a computer that never connects to the Internet, we have developed a completely manual activation process and instructions. It is not that difficult, really.